In my second part of Filmmaker's Paradise in The City With The Golden Gate Bridge I will cover more highlights of the San Francisco Movie Tour me and my best friend were able enjoy. Be sure to read Part 1 here. Market Street, also known as Main Street, cuts through San Francisco on the diagonal. 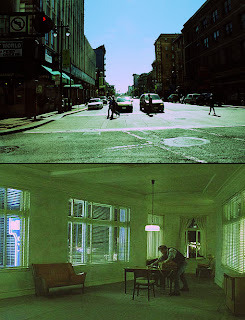 The flatiron building where the Interview with a Vampire (1994) takes place is at the four way intersection of Market Street, 6th Street, Taylor Street, and Golden Gate Avenue. Tom Cruise and Brad Pitt star in the movie where a vampire tells his epic life story: love, betrayal, loneliness, and hunger. During the tour we had an one hour stop at City Hall. The architectural details appeared Italian Renaissance and Baroque in style. 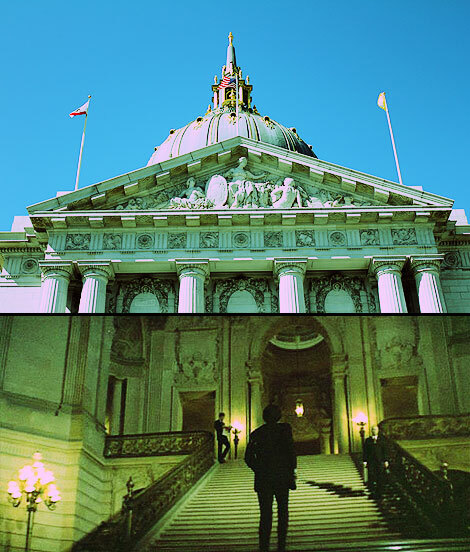 Walking up the grand stairway in City Hall felt strangely familiar. Perhaps it has to do with the number of movies it has appeared in, not realizing it. Clint Eastwood as Dirty Harry (1971), Harrison Ford in Indiana Jones: Raiders of the Lost Ark (1981), James Bond : A View to Kill (1985) with Roger Moore, Tucker: The Main and His Dream with Jeff Bridges, High Crimes (2002) with Ashley Judd and Morgan Freeman, Milk (2008) where Sean Penn played Harvey Milk, the first openly gay man to be elected to public office in California, who was assassinated in the building. DeeJay, Stephanie, and Michelle, Uncle Joey and Jesse. Most famously showcased in the opening sequence of Full House, the gang has their famous picnic in Alamo Square Park with the row of painted Victorian houses (aka Painted Ladies) in the background. 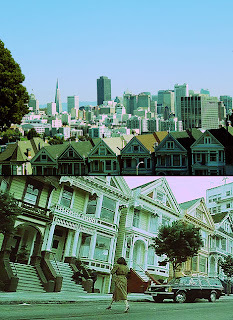 There are also a number of movies incorporating shots of the Painted Ladies in Alamo Square. They include Junior (1994) with Danny Devito and Arnold Schwarzenegger (what were the filmmakers thinking? ), Invasion of the Body Snatchers (1978), and So I Married an Axe Murderer (1993) with Mike Myers himself. 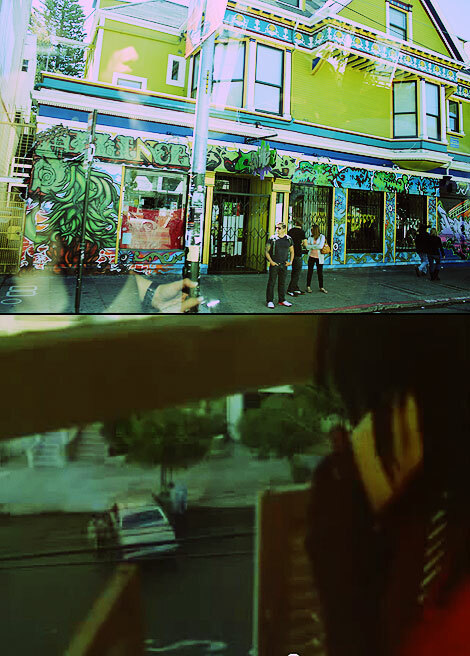 The 1960s Hippie movement and the Summer of Love all began in Haight Ashbury. Bob Marley, Jefferson Airplane, the Grateful Dead and Janis Joplin all lived a short distance from the famous spot. Psychedelic colored Victorian houses and murals can be seen in this neighborhood. Metro (1997) with Eddie Murphy and Burglar (1987) with Whoopi Goldberg feature the area as the shady part in town. 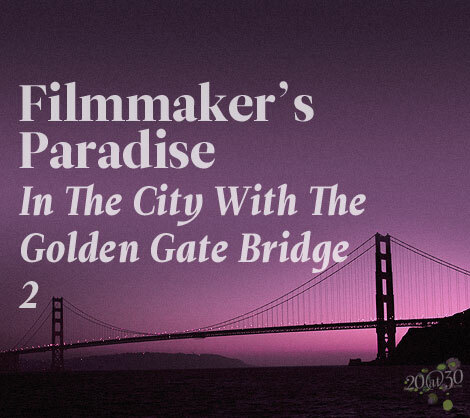 Stay tuned next week for the conclusion of Filmmaker's Paradise in The City With The Golden Gate Bridge. And yes there will be Star Trek and Golden Gate Bridge!